The Cambridge philosopher Frank Ramsey (1903-1930) died tragically young, but had already established himself as one of the most brilliant minds of the twentieth century. Besides groundbreaking work in philosophy, particularly in logic, language, and metaphysics, he created modern decision theory and made substantial contributions to mathematics and economics. 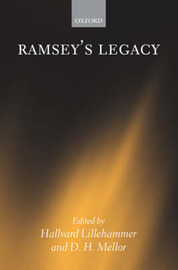 In these original essays, written to commemorate the centenary of Ramsey's birth, a distinguished international team of contributors offer fresh perspectives on his work and show how relevant it is to present-day concerns. Each of the ten essays addresses fundamental and contentious issues, including success semantics, propositions, infinity, conditionals, conceptual analysis, decision theory, and intergenerational justice. They also shed light on the intellectual context in which Ramsey developed his thought, including his relationship with such leading thinkers as John Maynard Keynes, Bertrand Russell, and Ludwig Wittgenstein. The volume will be indispensable reading for anyone interested in the recent history of philosophy and economics, as well as for practitioners and students of logic, metaphysics, philosophy of mathematics, philosophy of science, philosophy of mind, decision theory, and welfare economics.